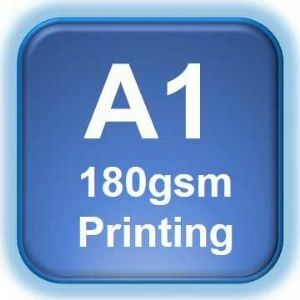 A1 180gsm Poster Printing (841 x 594mm - Landscape or Portrait). Printed at high resolution onto a smooth silk matt 180gsm poster paper. These posters are colour calibrated & perfect for Matt Photographic Prints, Poster Presentations, Digital Artwork & Map Printing. These Posters are not Laminated. Another order very satisfactorily received, with good advice and speedy service. Thank you. Great service, prompt reply and delivery and good packaging. Poster printed at good quality. Will use them again !